A straight road, no hills test track for testing trucks in Austria between Highway A12, close to Salzburg, and Highway A4, close to Wien. The road will run in the same general direction as Highway A1. 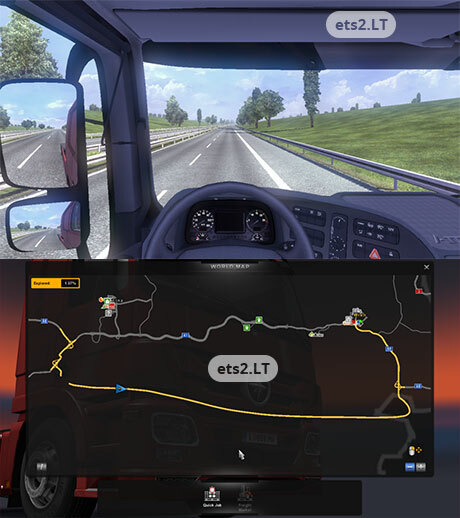 AI cars are disabled on the road so you wont need to avoid them when testing your trucks. Remember that this is a beta, so please don’t complain about open holes in the world or the lack of gas stations on the road. i will probably add gas stations soon. Make sure to read the README file in the .zip archive once you download it to read how to install this and for more info. The Map should work now, I re-uploaded the mod. The old link in the Mod description still works, but the download now takes 80MB instead of 33MB. Please make sure to make a new game/save when using this mod. Thanks. Doesn’t work, atleast not for me. The road doesn’t show up in real-time nor on the map. I have it installed in the Mods folder and activated (enabled) in game.